Tonight on CBS Person of Interest continues with an all new Tuesday January 6, season 4 episode 11 called, “If-Then-Else.” and we have your recap below. On tonight’s winter premiere, the team try to prevent a global catastrophe when Samaritan launches a cyber attack on the stock exchange. On the last episode, Samaritan showed its power by erasing crime from the city for a day in an attempt to force The Machine out of hiding. Did you watch the last episode? If you missed it, we have a full and detailed recap right here for you. This is definitely one series that you don’t want to miss. Don’t forget to stay tuned to Celeb Dirty Laundry where we will be blogging every episode of Person of Interest’s fourth season. #PersonofInterest starts now. Harold and Root watch a stock ticker and she tells him Samaritan is taking down the stock market. He says a collapse in the US economy will cause a ripple effect around the world. He asks why the fail safes haven’t tripped but then the market rebounds a little. Root says Samaritan is doing small upticks to keep the fail safes from kicking in. Root talks about a software program to stabilize the market but it has to be deployed on site. Root calls Sameen who says she’s had better days. She’s got an embezzler hanging on a ledge and Root says they’re headed to the stock exchange to save the world. She asks Sam for a metro card. Lambert reports to Greer that the operation is going as planned but he wonders if Samaritan’s move is too public. Greer says establishing a new world order wont’ go without notice. He says they need to watch out for the acolytes of the machine who will try to stop this. He says they’ll be in for a rude awakening. Root and Harold show up to the NYSE and tell them they’re there for the cameras. Reese took some out to legitimize their visit. Harold sits down at the keyboard and seems to restore it. Root says they need to go to central command. Harold says Reese is good for now and they don’t need any more cameras down. They are taking out cameras to blind Samaritan while giving the machine perfect sight. Reese and Lionel hop in the elevator with them and Lionel asks why they’re not on the floor. Harold says only 10% of trades take place on the floor. They have to get into the server room to implement the solution. 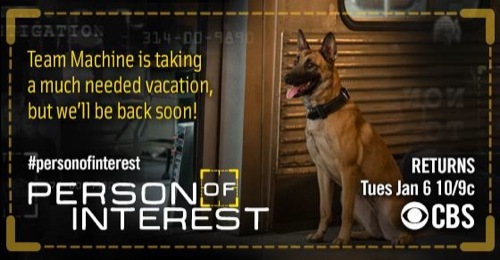 Sam has eyes on a guy on the subway – his company handles security for the NYSE. They need his palm print since access is biometric. Sam says she can do it. Then there’s a guy on the train with a bomb vest who is disgruntled about losing money in the market and he threatens to take out a broker and everyone else. Sam tells Root it will be a few minutes. The security feeds come on line and Samaritan spots them and issues lock down orders. Root says it’s a trap. The lights go out and the elevator is locked down. Lionel asks now what and Root says there is a post 9/11 protocol in place. Security starts taking shots at them and Root leads them down a corridor and into a kitchen. Reese has his gun out and Harold says they need a plan. Root asks the machine for some help when she spots a camera. The machine is calculating alternatives and then runs through possible strategies as time seems to slow to a crawl. The security guards have almost shot through the door into the kitchen and it looks like Root, Harold, Lionel and Reese are in big trouble. The machine is crunching numbers and working a solution. We see back in 2003, some men playing chess in the park, a dog being walked, a fountain coming on and Harold sitting alone at a chess table. A guy approaches him and asks for a game. Harold says he’s playing with a friend and the guy says he’s been sitting there alone for hours. Harold looks at a nearby camera and says his friend is shy and indecisive. The guy gives up and walks off. Harold talks to his phone and explains the game of chess and says by the second move there are more than 72,000 moves then it expands to 9 million. His phone buzzes and he says there are more possible games of chess than atoms in the universe. He says there is an infinite sea of possibilities and if you make a mistake, you can fix it in infinite ways. He tells her to relax and play. He makes a move for her. Back in now, Root asks for help and the machine crunches data. Root gets the message and tells them to open the door and turn left. She tells Harold they are headed to the server room while Reese and Lionel work the escape route by cutting one of the elevator lock cables. She says the machine will tell them how. Root and the others are ready. They head out the door shooting and take down their attackers efficiently. Harold is distracted by a Degas original and says you need to appreciate the world you’re saving. Root takes out a couple more attackers. Greer calls his operatives for a report and tells Martine the machine’s helpers are headed to the server room. He tells her to send a welcoming party and make sure no one escapes. He tells her to enjoy herself and she smiles. She sends two teams out to deal with them. Lionel and Reese are surrounded on two sides. They are back to back and Lionel tells him to remember the Alamo. Martine tells Reese the last time she saw him was in church. Sam tells Reese she’s having problems getting the code but he says he’s busy making death threats to Samaritan operatives. Sam pulls a gun on the guy with the bomb vest and comments on his BO. She says ordinarily she’d shoot him in the knee caps. She says to take off the best or she’ll shoot him in the head. He starts to detonate and she puts a bullet in his head and disengages it. She is arrested and tells Root she’s on her on with the code. Root tells Harold it’s plan B and they have to do it the old fashioned way. She shoots the lock and tells him not matter what to keep installing the software. He gets to work and she guards his back. More men descend on them and Harold is shot. She’s in shock as he collapses and his breathing slows then stops. He goes limp. She cries and looks up at the camera. The machine rates it as a terminated simulation. This wasn’t really happening, she was just running it to see what happened and sees this one is no good. There’s a reset back to the kitchen starting point and the machine strikes an option and pulls up another one as bullets fly through the door. Back in 2003, we see Harold playing chess and talking to the machine. She texts her answers and he says she’s doing well focusing on aggressive possible moves. She makes an aggressive move and he talks about how the queen piece used to be weaker and Queen Isabella demanded the queen be made more powerful. Harold tells the machine to be careful and says the queen is powerful and useful for winning and to be used as sacrifice for a trick. He asks her how many moves she’s considering and she says 647,000. He tells her she can take the time to consider everything or almost everything and he checkmates her. Back in the now, she chooses another option to try. Root tells them where to go and tells Reese and Lionel to go to the server room while she and Harold secure their escape route. They head out. Again, they take out the first wave of attackers quickly and split up. The guys make it to the server room and the Degas gets shot up. Greer gets a response from Lionel pretending to be one of his guys so that keeps him from sending Martine their way with the two teams. Harold says once they disable the elevator locks, Samaritan will know and will send teams their way. He says they’ll need a power source for the elevator. Root says the machine mentioned an old hobby of Harold’s. He talks about working on cars and looks at a back up generator. He warns Root that the elevator will be guarded and she says there’s more than one way to skin a cat. He says he feels sorry for the cat. Reese reaches out to Sam who says she has a psycho in the bomb vest. He tells her to convince the guy that his life matters. She talks to the guy and says he doesn’t really want to do this. She says he doesn’t want to hurt all these people and says he must have something or someone to live for. He says his wife is sick and now he can’t afford her medical bills because of the jerk investor. Sam say she doesn’t have to waste his death. She tells him to die for something he loves. The broker tells her to shoot the guy. The guy goes to detonate and she shoots. She ends up arrested again and tells Reese he’s on his own. He shoots the door and that sets off alarms. They shoot guards in the room and set up the software to go. Reese watches the door. Harold gives him the code to start it up. Lionel is flummoxed and Harold sends him a text. Reese says they’re sitting ducks and need cover. Reese shoves Lionel into a room and tells him he has to be the hero. That makes Lionel safe to run the program. Reese is wounded but keeps fighting. Then he gets shot several more times and finally goes down. Lambert says he seems cheerful for a dead man and Reese says he’s carrying a Samaritan standard issue grenade. He set it off and that blows up the room. Root chops into the concrete and finds several cables but isn’t sure which one to cut. Root asks Sam if she’s busy – she’s in the back of a cop car. She tells her she’s been arrested and says they don’t have time to chat. Root asks why she’s afraid to talk about her feelings and Sam says she’s a sociopath and doesn’t have any. Root says she’s a reformed killer for hire and they’re perfect for each other. Sam says if they were the last two people on earth after Samaritan wipes them all out, maybe they can talk about it. Root takes that as a good sign. Root is surrounded by Martine and her men and is gunned down. The machine decides this scenario is also a bad one. The machine resets her decision making back to real time. They are back in the kitchen. The machine prepares another alternate scenario to run. This time, Root says they all go left to the server room together then move to secure the escape route together as a team. They roll out. Lionel kisses her and says it’s okay since they’re in a simulation. They take out the attackers outside and hit the server room. The Degas is noticed then shot up to Harold’s consternation. Martine and her thugs progress. Sam calls and Reese tells her to talk to Lionel. He says he knew a guy who wanted to kill himself and says he felt alone. She asks how he helped and he says he didn’t, the guy killed himself. Sam talks to the guy and says she knows he’s fallen on hard times. She says a lot of people will be devastated after today. She talks to several other people who tell them what this has done to them all. Sam says life is crap, welcome to the human race. She tells him he’s not alone. The other people encourage the bomber and tell the broker to shut up. He pulls off the battery and surrenders. The subway guards come in and take the guy off and Sam isn’t arrested this time. Sam has the security guy who offers them the code. They come in and move the programmers out of the way. Samaritan notices the time is too short. They get notes on what to say to the people to get them to cooperate more nicely. They achieve it. Lionel chops through the concrete. Sam and Root chat – it’s not specifics – it’s just the machine characterizing the nature of their remarks. Then she resumes the full simulation. Harold is working on the generator and they call Root to help. She tells them the operatives are on the way and tells Harold to hurry. He has the power and tells them to cut the lock cable. Lionel hacks through it and they all run over. They’re waiting. Martine and her men close in and she tells them shots to the head and center mass. The four engage in gun play and the machine calculates each team member’s odds of survival is just 2% but selects this as the most favorable option and elects it. Back in 2003, Harold is still teaching chess to the machine. She challenges him to another game and he says he taught her chess and says it’s a useful mental exercise and says many thinkers have been fascinated by it. He says he doesn’t enjoy playing it because it was a game born in a brutal age when life counted for little and people believed some lives were worth more than others – kings or pawns. He tells her to remember that chess is just a game and real people aren’t pieces and you can’t assign more value to some people than others. He says people are not things to be sacrificed. He says the lesson is that anyone who looks at the world as a game of chess deserves to lose. He leaves the chess board set up and walks away slowly. Back in now, she selects the option that will likely kill them all but will save the stock exchange. The option is translated to Root and she tells them what to do. She says they’re headed out together and will stay as a team from server room to escape. Root says to trust her and says these are their best odds. They head out, for real this time, and take out the Samaritan operatives in the hallway. Harold sees the Degas and Root takes it off the wall and sets it on the floor which saves it. She tells him it’s no good to save the world if they can’t enjoy it. Sam gets the guy in the bomb vest to disengage it and secures the entry code. They head in, upload the software successfully. The news says the market is in recovery. They head out to secure their escape route. They get the power to the elevator and Lionel calls Root down. She points out the proper cable and says the operatives are there early. They run back to Harold and she tells him to hurry. She tells Lionel which cable to cut. He does it. They head down the hall. They come under fire and return it. The elevator shows power. They’re out of ammo except for Root. Reese takes a shot. He says he’s all right and Lambert tells Greer they have them covered and he says all games must come to an end. Root checks her ammo and calls Sam. She flirts with Sam in her final moments but Sam is there and says they look like crap. She crawled through air ducts to get to them and has the explosive from the bomb vest. She throws it at the operatives and shoots it to set off an explosion. They grab up Reese as Root tells Sam they’re meant to be together. Sam says they would be like a four alarm fire in a refinery. The elevator controls aren’t working and Sam says there is an override button. Root says she won’t let her go. Sam kisses Root roughly then shoves her back, closes the elevator and hits the override button even as she comes under fire and returns it. Root watches as Sam is shot by Martine and goes down. Sam still returns fire and shell casings fall all around her. Martine shoots her again and she spins down. The machine runs numbers on how to save Sam as Martine takes aim at her head. She has no good options. The elevator closes and they’re gone but they hear the final gunshot. It looks like that’s the end for Sam, but you never know!